Had the Wightlink crew not acted as swiftly as they had, it is likely the man would have drowned. They have been honoured for their bravery and quick thinking. Her Majesty’s Lord-Lieutenant for Hampshire, Nigel Atkinson, has presented awards from the Royal Humane Society to Wightlink Deck Officer Steve Chamberlain, crew members Robbie Mihell, Chris Freemantle and launch coxswain Peter Simmonds for saving a drowning man in Portsmouth Harbour (Fellow crew member Paul Cooke was unable to join them). The ceremony was held at Wightlink’s Portsmouth car ferry terminal on the main vehicle deck of Victoria of Wight just before the crew started a night shift. 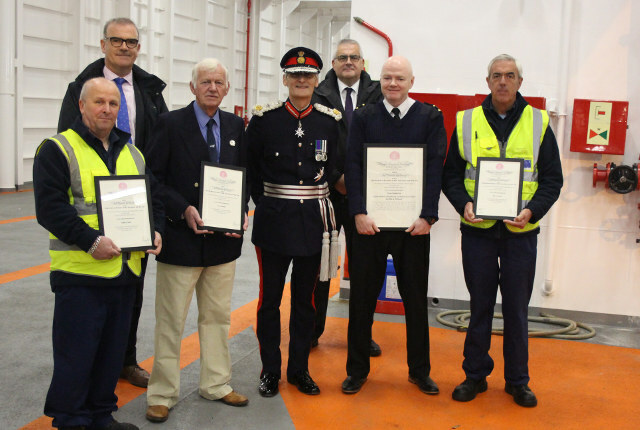 The certificates recognised the St Clare crew’s achievement in rescuing a man from the icy waters of Portsmouth Harbour on Saturday 3 February 2018. Robbie Mihell spotted the man in the harbour, called ‘man overboard’ and a life ring was thrown in his direction. When Steve Chamberlain realised the man was incapable of taking it, he jumped into the Camber Dock and supported him until Peter Simmonds arrived in Wightlink’s launch to help. Robbie Mihell, Chris Freemantle and Paul Cooke also boarded the launch to help their colleagues pull the casualty from the water. “I am delighted to congratulate the crew and present these awards to Steve Chamberlain and his colleagues on behalf of the Royal Humane Society. “Had they not taken swift action, it is likely the man struggling in the water would have drowned. This is the third honour that Steve Chamberlain has received for his part in the rescue. He has also been awarded the Merchant Navy Medal and an Individual Commendation from the Shipwrecked Fishermen and Mariners’ Royal Benevolent Society. “I just acted instinctively when we saw the man wasn’t able to get into the life ring. We carry out emergency drills all the time but it’s different when it’s happening for real.